When protons rest on the metal-bound dinitrogen groups (green), this is the desired location for producing ammonia or NH3. If the protons rest on the metal center (red), the reaction halts. Subtle differences in the amine groups (blue) greatly change where the protons end up. Understanding the motion of protons is critical to understanding and then designing catalysts for energy and chemical production. Enlarge Image. Results: Where protons, or positive charges, decide to rest makes the difference between proceeding towards ammonia (NH3) production or not, according to scientists at Pacific Northwest National Laboratory (PNNL) and Villanova University. By designing and examining the reactivity of five complexes with molybdenum metal centers, the team found that subtle differences in the complexes greatly change where the protons end up. The differences were in the structure of the ligands, molecular frameworks that surround the metal. 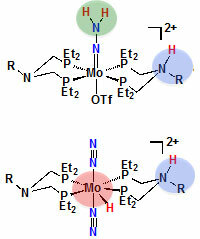 When the ligands were more willing than a metal-bound dinitrogen group to take in a proton, the protons ended up binding with the molybdenum center, essentially ending up stuck in the wrong place. But, when the ligands ability to accept protons was more closely matched with that of the dinitrogen group, the protons ended up going to the desired location for producing NH3. “We showed how the metal compound works and how it facilitates proton movement,” said Dr. Liezel Labios, a synthetic organometallic chemist who led the experiments as a postdoctoral associate in the Center for Molecular Electrocatalysis, an Energy Frontier Research Center led by PNNL. Why It Matters: Renewable energy. Available food. Effective medicines. The reactions behind these products and countless more are not as efficient or effective as we want. Too much waste. Too much energy. Or simply not possible with today’s chemistry. To improve the reactions, scientists must first understand and then design catalysts, the molecules that drive reactions without being consumed by them. Specifically, scientists need to know how catalysts move protons, so they are delving into one reaction – ammonia production from dinitrogen molecules – that is a six proton, six electron process. Understanding the in’s and out’s of how the complexes react with protons could lead to more efficient catalysts. “This study is leading us toward optimizing complexes to facilitate difficult reactions by giving us details about how altering the molybdenum compounds ligand structure will influence their reactivity,” said Dr. Michael Mock, who leads the nitrogen studies at the Center for Molecular Electrocatalysis. Methods: The researchers are studying the conversion of dinitrogen molecules to ammonia and are focused on understanding how, where, and why the 6 protons involved in the reaction move. In designing the metal-based scaffolding to study the first step in ammonia production, the team was inspired by both natural processes and industrial processes that produce ammonia. Natural processes, which are catalyzed by nitrogenase enzymes, proceed at ambient temperature and pressure. In industry, the Haber-Bosch process uses a heterogeneous catalyst and produces millions of tons of ammonia every year under conditions using high temperatures and pressures. “Our work is inspired by these processes, and we are striving to understand proton movement from a molecular perspective in this challenging multi-proton, multi-electron reaction,” said Labios. The team took on the first step in producing ammonia: forming a molybdenum-hydrazido intermediate (Mo-NNH2). They tested five different compounds with different ligands bound to molybdenum at a low oxidation state, Mo(0). Each molecule had different ligands containing different amine groups as proton relays, which are basic sites designed to facilitate proton movement in the presence of acid to the metal-bound dinitrogen group. Using nuclear magnetic resonance spectroscopy, in situ infrared spectroscopy, and their expertise with proton motion, they determined the protonated products that were formed. In complexes where the ligands and the dinitrogen groups did not have similar pKa values, measures of their capacity to donate protons, the reactions produced molybdenum-hydride compounds, in which the protons were attached to the molybdenum center. This molecule is not readily converted into the desired molybdenum-hydrazido intermediate, Mo-NNH2. Further, certain ligands resulted in complexes that were not highly soluble, limiting their ability to work in the reaction’s solutions. When the pKa values between the ligands and the dinitrogen groups were more closely matched, the reactions generated a greater ratio of the molybdenum-hydrazido triflate complex, the desired precursor. What’s Next? The researchers in the Center for Molecular Electrocatalysis are more closely studying the structural influence of the proton relays. Their results could lead to gaining further insight into how to match the pKa values and optimize the role of the proton relays in these complexes. They are also screening an array of molecules in the presence of protons and electrons to find one that can serve as a catalyst to produce ammonia. Sponsors: This work was supported as part of the Center for Molecular Electrocatalysis, an Energy Frontier Research Center funded by the U.S. Department of Energy Office of Science, Office of Basic Energy Sciences. Sheri Lense was supported by the DOE Office of Science, Early Career Research Program through the Office of Basic Energy Sciences.